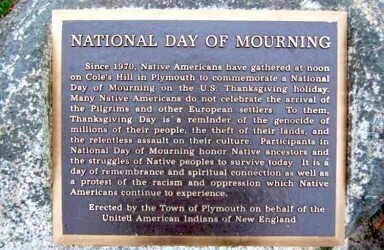 Thanksgiving Day seems an appropriate time to post this brief historical note about Colonialism in the United States. I’ll start by mentioning that this is the original territory of the Lenape, now known as the Delaware. Like most parts of North America, Pennsylvania & New Jersey were occupied by Indigenous people for thousands of year before the first European settlers arrived — archeological evidence dates back to approximately the end of the last ice age. Here in the Lehigh Valley, it was the Lenape, one of the first Indigenous nations to sign a treaty with the settlers (in 1778). The Haudenosaunee (Iroquois) Confederacy did not include this area, but had significant influence. In most Indigenous cultures, a strong ethic of stewardship and care for the land and all beings, but there was no concept of land ownership—treaties did not ‘sell’ land, but recognized that others could also use it. Less than 100 years later after the treaty, though, the government forced the Lenape to move west, first to Ohio and later to the Great Plains. (Some fled to Canada & other parts of the U.S.) Many of their sacred places were then taken over by the colonists. This is a very compressed history of Colonialism in our area, but it parallels what happened to most Indigenous people in North America: broken promises, displacement, and erasure. the Dakota Access Pipeline—when people in Bismarck, ND, feared it would contaminate their water, it was rerouted to the Standing Rock; thousands of Indigenous people who came together as Water Protectors to protect their land and water, but the pipeline went ahead anyway. Sacred sites are regularly subject to desecration (as also was true at Standing Rock), especially for purposes of extracting fossil fuels or minerals; the latest example is the threatened legalization of much of the ‘Bears Ears’ National Monument in the Four Corners area. The rate of abuse & killing of Indigenous people by police is even higher than for Blacks & Hispanic people. So why is Thanksgiving a good day to post about colonialism? 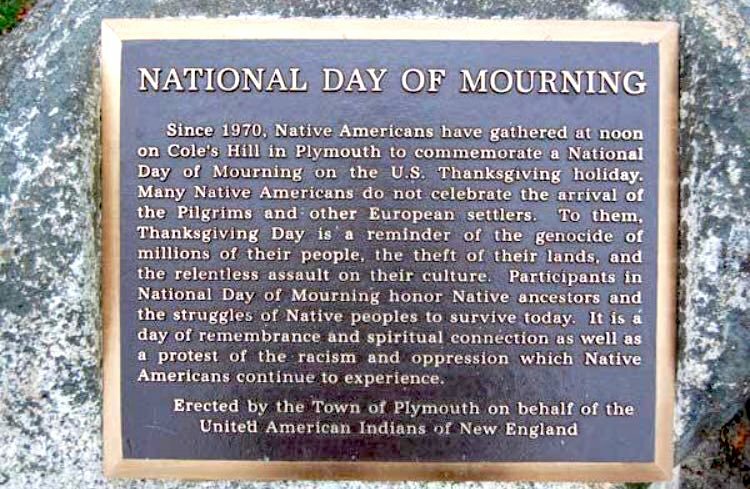 So don’t be surprised if Indigenous people don’t see Thanksgiving the same way you do. In many ways, it is symbolic of the settlers’ treachery, theft or destruction of natural resources, and genocide. NOTE: I am not an expert on Indigenous culture or history, so I apologize if I have glossed over anything. Please let me know if you see any errors!